So, I took some friends out to the beach because they wanted to learn to paint. 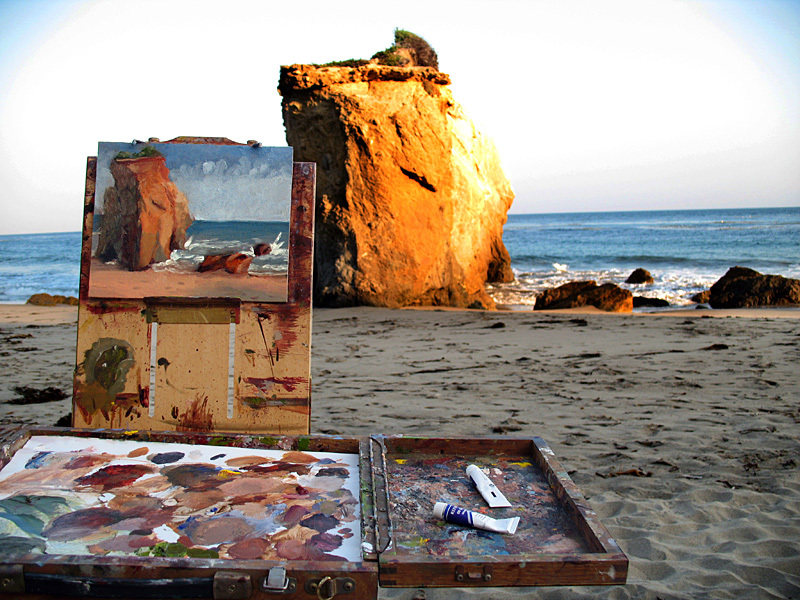 El Matador beach seemed like a likely choice because I love the rock structures thee and it is very interesting. Christina is from Dallas and she “says” that she has never (ever) painted before. So, I got everything set up for her and we began. Then, all of a sudden a wave of embarrassment swept over me as I realized that I have forgotten something… the paint and the brushes. DOH!!! Luckily Chip had just bought Naomi and Christina their very own starter sets of oil paints and they had them with them, and he also had a few brushed. So, we put out a bit of the primaries along with some white and started. Here is Christina’s first attempt at painting. A pretty fantastic start, if you ask me. That is a GREAT first painting. I really would like to take up painting too, but I seriously do not feel like I can do it…so that is why eventually I must! Tell Christina that I also think she is off to a great start!